Until a few years ago, horizontal top tubes were the norm. The current trend in comfort-orientated sportive bikes has led to modern machines, with modern materials, being designed with all-day riding at the top of the customer priority list. Weird and wonderful tube profiles and sloping top tubes are engineered to create bikes that are both stiff and comfortable. However, that wasn’t always the way. Eastway, a name aligned with racing tradition, has shunned the modern approach with this, the ST1.0, a delightfully old school bike that shuns the idea of modern design. Before carbon there was no need to manipulate frame angles to engineer comfort when a material as malleable and springy as steel was used in construction. It exuded comfort from every boss hole. And that’s what we have here. Reynolds’s dependable 520 grade steel on the main frame, with a more budget-conscious, unbranded steel fork. A bike that to many would fit the bill as a winter trainer, though really it could be any number of things. The ST1.0 seems like the kind of no-nonsense design I could really get to grips with. is no lightweight. Luckily, with aspirations as a durable, all-seasons machine built to cope with a British winter, the weight should help flatten any bumpy road surfaces and punish its rider into some semblance of fitness before spring comes around. Out on the road, as expected, the frame provides a very comfortable base for which to build a bike around. The geometry is more than a nod to the old school with that flat top tube and the low front end is almost on a par, on paper at least, with a full-on race bike. The head tube is actually 10mm shorter than my summer bike, at 130mm. It means you’ll have your head down on those long winter rides, perhaps sacrificing a little bit of comfort in terms of riding position. That said, if you’re lucky enough to own both a winter and summer bike, it should make switching between the two less of a shock to the system. Disc brakes are almost the go-to choice these days, and they would make a lot of sense on a bike of this kind, especially with the weight you’re carrying down hills and into corners. I really struggled to halt the momentum on steeper descents with the Tektro cantilever brakes. There is an advantage over a regular dual-pivot brake, however, and that is the ability to fit extra-fat tyres. The clearance is generous, and with 32c tyres fitted, there’s room for at least an extra few millimetres inside the rear stays for something more substantial, should you fancy going off-road. Talking of tyres, the standard Kendas are a little heavy to get up to speed, but I was pleasantly surprised with their low rolling resistance. They survived our testing period intact, despite some terrible conditions, and made light work of any lumps and bumps, of which there are incalculable amounts around my weekend riding roads. Actually the tyres, combined with the compliant steel frame, made for a very comfortable and forgiving ride. Eastway hasn’t changed much from last year’s model, other than leaving a rather fetching aqua blue paint job behind in favour of this smart black option. Black is the more rational choice, I suppose, but it’s a shame it’s become something of a default colour for the winter trainer. It’s nice to hide the dirt for a little longer, but at some cost to morale perhaps, for a bright paint design surely brings something to the package on those cold and miserable grey days. So what to make of it all? Well, it’s practical. There’s the comfortable and no doubt long-lasting frame with its tough, chunky tyres and mudguard eyelets. 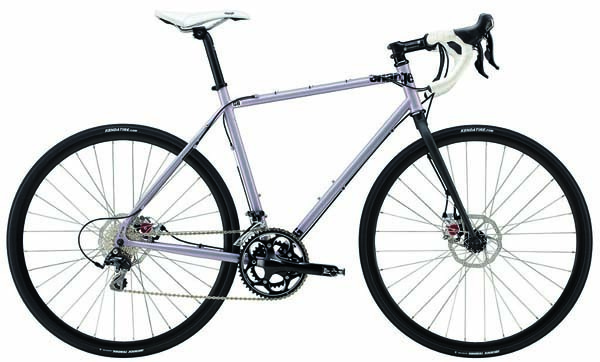 It has mounting options for front and rear racks, and a gear ratio to help out with some weighty touring. As Eastway’s tagline suggests, it is ‘built for the city.’ It rolls superbly over the rough London roads, and although getting it up to speed is slow going, once there, it holds its own and feels solid, stable and secure in city traffic. On the downside, there are the heavy wheels and tyres, the squidgy brakes and (depending on your preference) the relatively low front end. So, it would seem, having counted up my comments, both positive and negative on the Eastway, we’re left somewhere around even-stevens. It’s a good all-round choice, but is let down by minor niggles which is a shame, as it has the potential to be a brilliant all-rounder; a real bike for life that would fit any situation. Club runs, commutes, touring, or even a bit of off-road racing. You name it, it’s up for it. It’s just not quite the full package it so clearly wants to be.